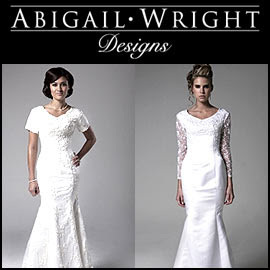 One of the most extensive collections of elegant modest wedding dresses that we've seen on the Internet belongs to Abigail Wright Designs. This shop, based in West Jordan, Utah, has produced some very attractive modest gowns with short sleeves, cap sleeves, 3/4 length sleeves, and other options. If you are seeking a demure wedding gown, you'll likely see something that you like within the website's gallery, but at this point in time it's uncertain whether you'll be able to obtain the item. The website blog states that as of May, 2011, Abigail will take an "indefinite amount of time off." The website does contain a phone number, so you may want to try a call in order to find out if something that you like is in stock.